Over the past few years it has become more and more common to see companies move towards K2 installations that are either completely hosted in the cloud or hosted in a combination with some servers on premise and some in the cloud. It has also been seen that many companies are taking the plunge and migrating their on premise SharePoint farms into the cloud using Microsoft’s hosted services. There are many reasons why this may be considered beneficial which unfortunately falls outside the scope of this article. As a result of the above trends, K2 installations are now more commonly required to be installed leveraging SharePoint online as opposed to on premise. This brings about its own set of unique challenges and pitfalls, but also benefits. 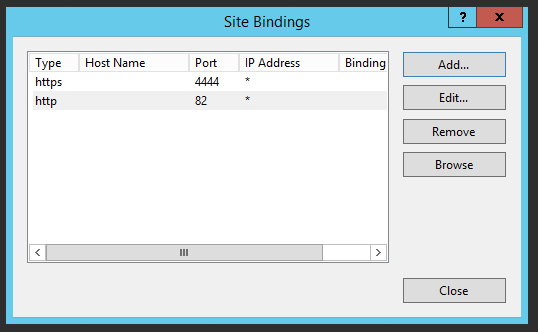 This article is intended as a step-by-step guide on a typical K2 server configuration that leverages a SharePoint online / O365 instance. Although the example screenshots and details are based on an “on premise” K2 server installation, this can be easily extended / extrapolated to apply to a K2 server hosted by a cloud service such as Azure or Amazon. A K2 server machine that can expose its HTTP web applications and end-points to the internet. In the below example we will be making use of a dynamic DNS service to expose a local virtual machine. Most companies will have their own domain and will be able to register a subdomain for K2 which will point to the hosted K2 server. This is at the discretion of the company involved. A registered DNS record for the K2 endpoints (e.g. K2.yourcompanydomain.com). A valid SSL certificate for the above domain / sub-domain. Although it may be possible to configure an environment using self-signed certificates, from experience it has been noted that this almost always leads to problems and configuration issues either during the installation or later on. It is therefore required that an official SSL certificate for the chosen domain or sub-domain be purchased from a registered certificate authority. An Office 365 / SharePoint online account. This article will be making use of an Office 365 Enterprise E3 trial account. Official installations would normally make use of a registered, paid for O365 account. It may be necessary to access the company’s Azure AD (AD) management centre along with other administrative tools meaning you will need either an administrator account or access to someone who owns one. If you would like to attempt the installation using a trial O365 account, information can be found here. The first step is to configure your K2 blackpearl server along with any required supporting technologies. In this example, because we are using a K2 virtual machine on a local network that will be exposed to the internet using a dynamic DNS account, most of the supporting technologies (Active directory, SQL, Exchange etc.) will be hosted on the K2 server itself. This allows for ease of demonstration, when configuring such an environment at a customer however, many of these technologies will be hosted on remote servers, presiding either on premise within the same local network or in the cloud. It is therefore recommended to keep a list of servers, URLS, accounts etc. in use in the environment so that these details can be used in any wizards or configurations where required. As the full details around a typical K2 installation and configuration are outside the scope of this article, full details will not be discussed. For further reading, please reference the following articles: Prerequisites for the K2 server role, K2 blackpearl installation guide. Once the prerequisites have been confirmed, the K2 installation files can be downloaded from the following location : https://portal.k2.com/downloads/bp/Default.aspx – The latest version at the time of this article is 4.6.11. It is recommended that the combined installer be downloaded as most components will be installed in this example. It is highly recommended that the K2 workspace / identity / runtime services site as installed by the K2 installer use the same site as that which will be used by K2 SmartForms. Although it is possible to run these components on different sites with a different domain / URL, sometimes authentication problems can arise when the K2 identity site is contacted from a different domain, things seem to run more smoothly when the same domain and site is used. 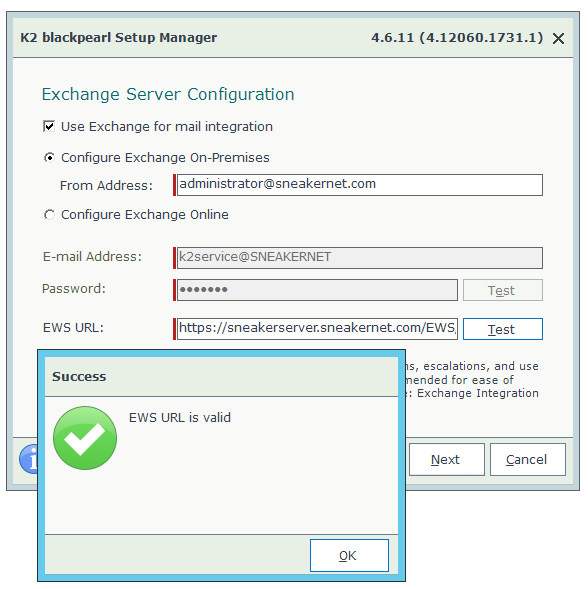 It is important to note that if the K2 service account does not have an email address in Active Directory, Exchange auto discover will fail, even if the from address entered exists and has an associated AD account. 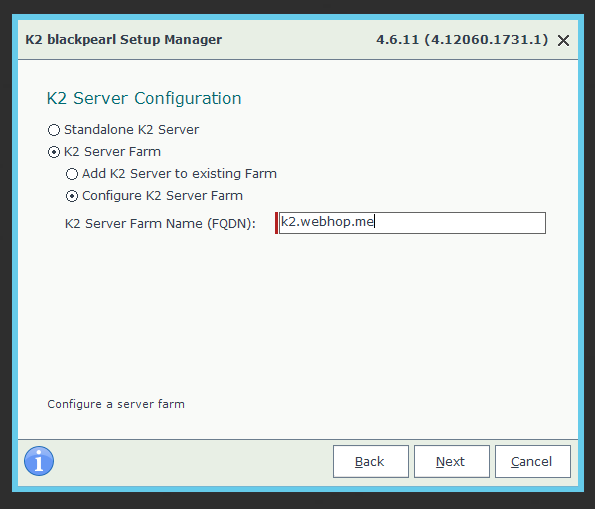 Install SmartForms to the same site as the K2 blackpearl services site. Register SSL certificate (step 1.4). Update bindings of K2 site in IIS – make use of registered certificate (for all k2 sites / services). 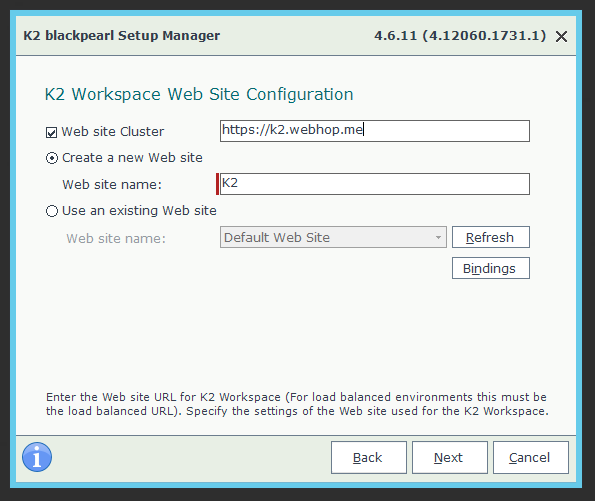 Re-run the K2 blackpearl configuration (from start menu) – this updates the relevant blackpearl environment fields. 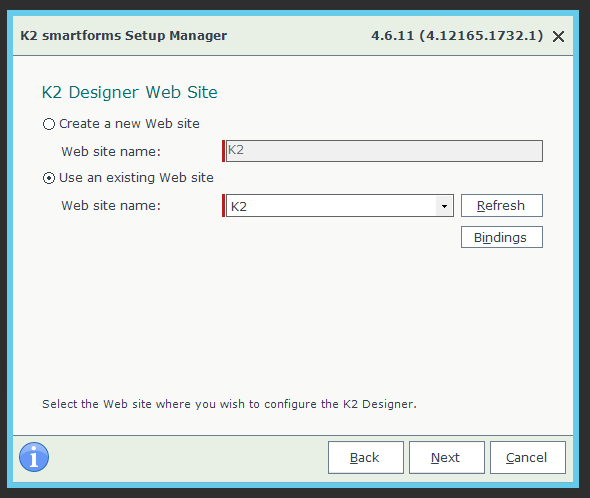 Re-run the K2 SmartForms configuration (from start menu) – this updates the relevant SmartForms environment fields. Check the SmartForms designer and runtime site web.config files to ensure that the realm values were updated successfully. 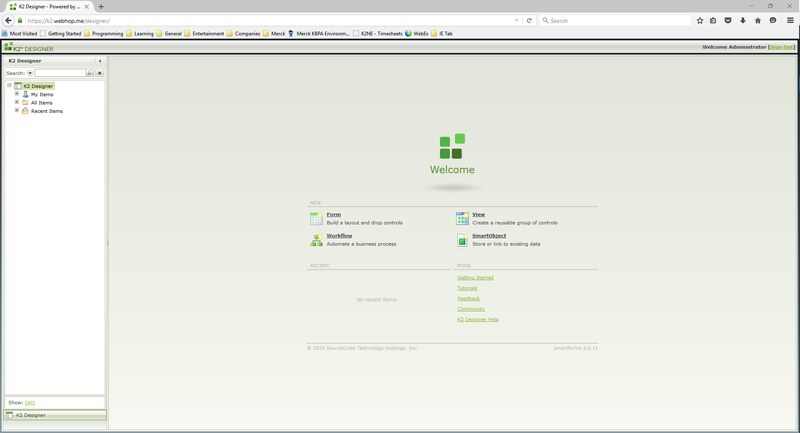 First, we will install SmartForms to the same site that we installed the K2 blackpearl web components. The same site should be used for both the designer and runtime web sites. It is also advisable that both the designer make use of the same application pool (that is separate to the application pool used by the default blackpearl web applications / services). Once the K2 SmartForms installation has completed, you can go ahead and install the SmartForms control pack. This installation is straight-forward and therefore will not be discussed. Once SmartForms and the control pack have been installed and configured, you are now ready to install your SSL certificate on the K2 server. In most cases, this will typically be a certificate for a sub-domain of the company’s top level domain, for example bpm.mycompany.com. This certificate would usually be purchased from a trusted certificate issuer (such as Thawte) and then handed over to you for installation. Different issuers typically provide certificates for registered domains in different formats and the installation of the certificates for use in IIS are also often different. It is recommended that you follow the guidance given from the issuer in question which is usually available on their site or through their support channels. If it is not visible here you will be unable to update the bindings for the K2 site in IIS. For further information on creating and registering a self signed certificate for testing or development purposes, please see this post. Once the certificate has been installed on the K2 server, it is time to reconfigure the K2 site created during the installation to use installed certificate. In this example, we will configure the K2 site to make use of a certificate installed that was issued for the domain “k2.webhop.me”. After clicking on close, your K2 web site should now be correctly configured to run with your certificate when the site is accessed with SSL, and will also respond to requests for that host name on HTTP. It might be necessary to perform an IISRESET now for good measure. The next step is to reconfigure K2 to recognise these changes. 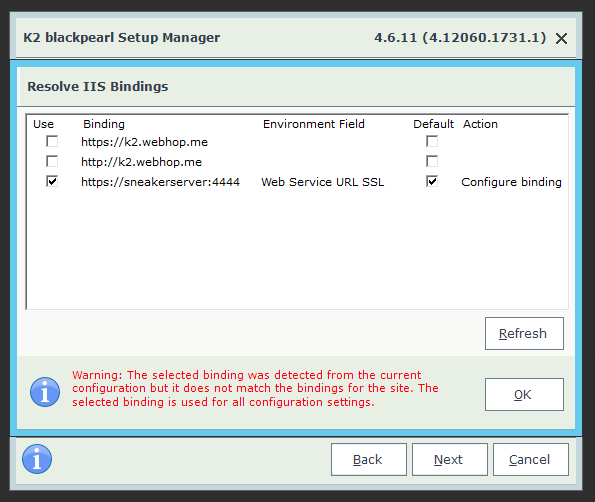 Because the bindings for the K2 site have now been changed, it is necessary to re-run both the blackpearl and SmartForms configuration wizards so that the K2 installation can make adjustments for these changes. 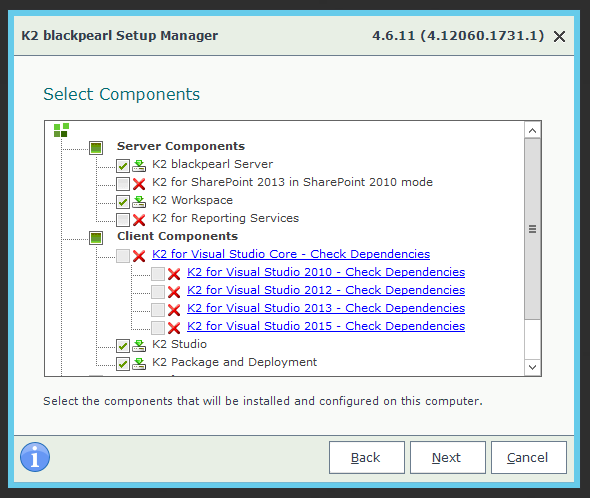 First, execute the K2 blackpearl setup manager from the start menu. 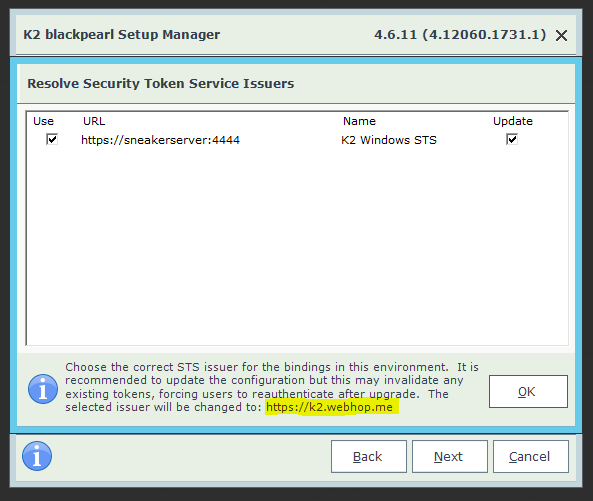 Once it has started, make sure to select the “Configure K2 blackpearl” option on the maintenance screen. This window can be a bit confusing. What it is basically saying is that the selected issuer will be updated with the new URL as can be seen with yellow highlighting. This is normal and it means that the setup will also update the issuer URL. Click on “Ok” and continue to the end of the configuration. 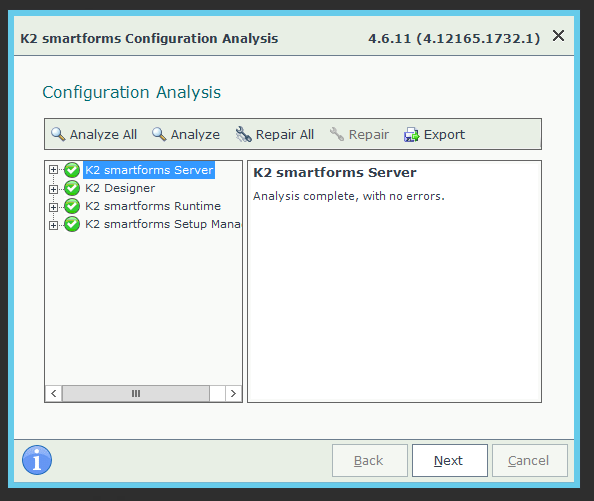 Once the blackpearl reconfiguration has completed it is necessary to then reconfigure SmartForms the same way, also by running the K2 SmartForms setup manager from the start menu. The screens for the bindings of both the designer and runtime sites should be adjusted the same way as for blackpearl with only the new bindings selected and the HTTPS binding selected as default. Select “Ok” and continue with the reconfiguration through to the end. 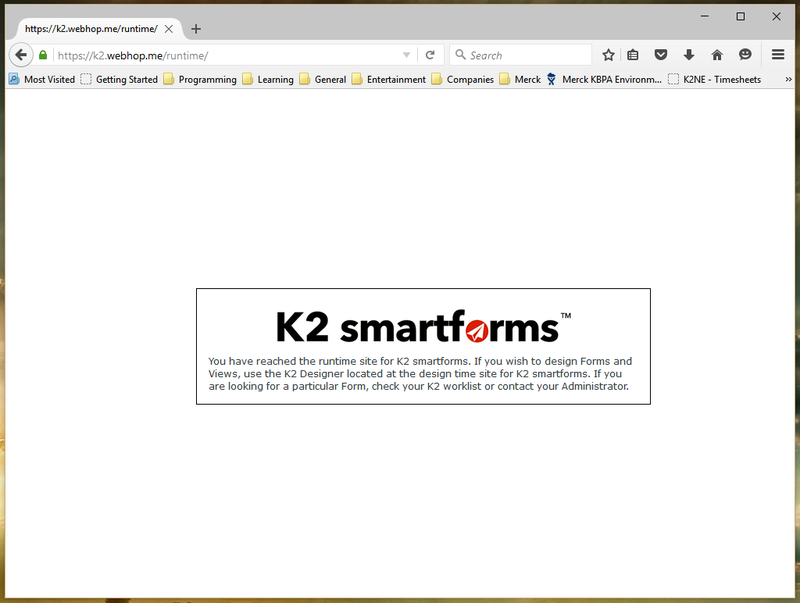 Because the K2 for SharePoint app running in our SharePoint online site will be referencing the SmartForms runtime site that is running on our K2 server, it is obviously important that the URLs for K2 SmartForms be accessible from the internet. As well as being accessible, it is also important that the sites do not generate any SSL / certificate related errors as this will result in the K2 for SharePoint app registration failing later. This is a step that administrators often miss. It is required that the K2 for SharePoint setup manager (found as part of the K2 installation package) be installed on the K2 server. 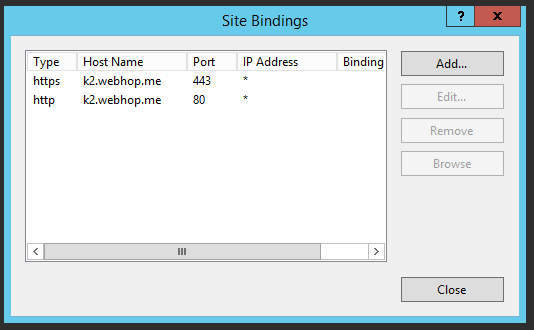 This allows for the components enabling K2 to interact with SharePoint 2013 to be installed. This installation is quite straight forward. 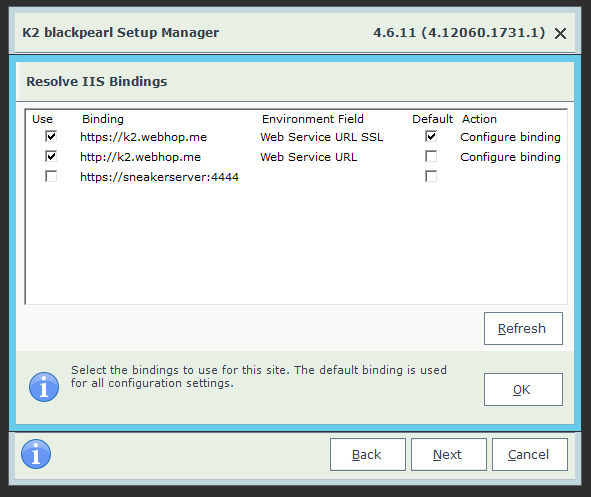 Simply execute the “Setup.exe” file inside the “K2 for SharePoint 4.6.x” folder inside the K2 installation package where blackpearl and SmartForms were located. Ensure all values are correct for your environment and run the setup manager through to completion. There should not be any issues with this installation. The next step in the process of configuring a K2 with SharePoint online installation is to configure your SharePoint online site to recognise and make use of the K2 SmartForms end points that form part of your installation. In many ways, configuring K2 for SharePoint online is easier than its on-premise counterpart, largely because the configuration of the SharePoint app domain is done for you. 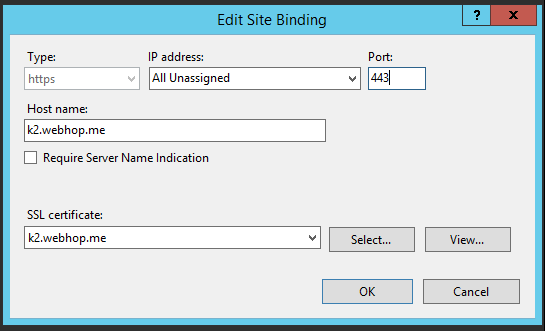 Navigate to your SharePoint online site and log in as an administrator. Click on the cog icon on the top right next to the account button / user icon. Click on “add an app”. 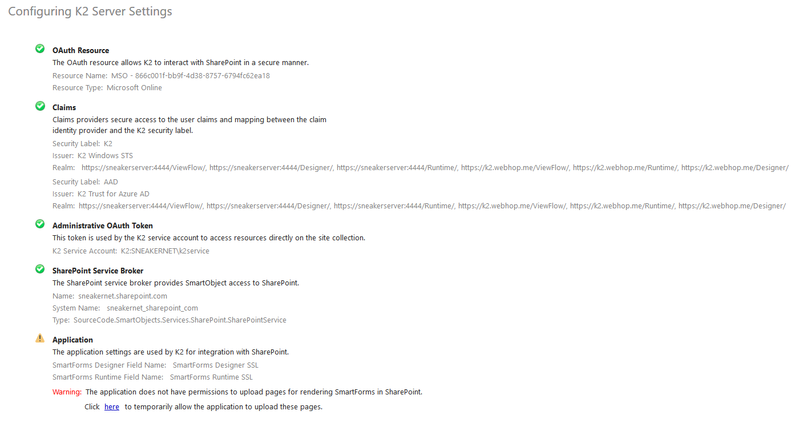 Click on “SharePoint Store” in the links list on the left. In the search bar, search for “K2 blackpearl”. 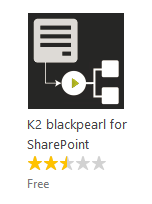 Click on the icon, the “K2 blackpearl for SharePoint” app details page should be displayed. Click on the “Add it” button. On the page that follows stating “Confirm that you wish to add the app” click on the “Continue” button. You should then see a page stating “You just got this app for everyone in your organization”, click on the “Return to site” button. Once the URL has been validated successfully (assuming there are no problems with the security certificate or the SmartForms installation itself) the registration wizard should then run through. You may need to “Accept” certain permission requests by the application for your SharePoint online account. The following section details what has happened when the configuration wizard has run along with the changes that you may see on the K2 side. OAuth trust established between the K2 server (service account) and SharePoint online. The K2 server can now perform actions on the SharePoint online tenant because the service account is trusted. The K2 server should also be able to impersonate users from the O365 Azure AD tenant when performing tasks on their behalf. Different tokens are created for SharePoint as well as Azure Active Directory. All OAuth Tokens and resources are created for you automatically. Azure Active Directory (AAD) security label created and configured in K2 against the AAD tenant within SharePoint. Information can be retrieved from AAD by the label using OAuth resources created in the above step. K2 Trust for Azure AD claim issuer created and configured in K2 against the AAD tenant within SharePoint. This issuer is configured via trust.k2.com. Claims mapping created between the AAD security label and the AAD claim issuer using settings for claims from the original issuer (https://sts.windows.net). This claim mapping allows K2 to authenticate users from the tenant AAD (the identity provider claim identifying the identity provider, e.g. sts.windows.net, and identity claim identifying the authenticated user can be decrypted and interpreted within K2). The great thing is that if following the outlined steps correctly, K2 will be able to perform all the above configurations for you. This means you should now be able to utilize your K2 on-premise SmartForms within your O365 SharePoint instance as well as make use of all the great K2 for SharePoint features made available through the K2 for SharePoint app. I hope this tutorial can be of some help. If you pick up on any errors or inconsistencies, please leave a comment below! This entry was posted in IIS, K2, K2 blackpearl, K2 SmartForms, Office 365, Security Certificates, SharePoint Online, SSL and tagged blackpearl, iis, K2, K2 blackpearl, K2 configuration, K2 SmartForms, K2 tutorial, O365, Office 365, SharePoint Online, SmartForms, SSL, SSL certificates on June 20, 2016 by Matthew. It is often necessary to make use of a self signed certificate to test a basic development or QA environment. These types of certificates are not really production ready as certificate errors will still be thrown on a client browser. For testing though, they can be added to a user’s local certificate store manually to prevent the ugly warnings from being displayed. Creating a certificate directly through IIS (Server node -> Server Certificates -> “Create self-signed certificate”) is not always ideal. After struggling with a few certificates that were created that way, I found that using two simple commands to create both a custom certificate authority for your certificate as well as the certificate itself yielded much better results allowing me to continue with whatever configuration or testing I had been performing. Once this has been executed successfully, the new self-signed certificate using your custom CA will be available in IIS – visible under server certificates. This entry was posted in Command Prompt, IIS, PowerShell, SSL, Windows Server and tagged certificates, command prompt, iis, PowerShell, self signed, SSL, SSL certificates on November 18, 2015 by Matthew. This is just a short post to update you as to why I have been so quiet recently and do a little bit of advertising for a great Webinar that my new Employer is hosting. In May this year I joined the team at K2 Northern Europe (K2NE) as a Technical Consultant. I am currently working in the Customer Success team with a focus on remote support and Technical Advisory Services (TAS). I still perform quite a few Kerberos configurations and hope to post some more regarding that soon. Webinar: 11th December at 10 a.m. CET (English) and at 3 p.m. CET (German). Ashley has over 7 years of K2 industry experience, focusing on business development in the Nordic (and DACH) regions he is an expert in K2 and SharePoint solutions. Having worked on some of the largest and most successful European K2 projects he now works as a Senior Technical Specialist helping new and existing K2 customers and partners get the best out of their K2 and SharePoint investment. Patrick Sender is a Technical Consultant at K2. Patrick has experience in IT solutions build on the Microsoft platform. He specialises in workflow and business process management, covering consulting, project management and implementation. This entry was posted in K2, Notices and tagged K2, K2 Northern Europe on November 28, 2013 by Matthew. In my case, the K2 server then started up successfully. This entry was posted in K2 and tagged K2, K2 blackpearl, K2 configuration, K2 Databases, K2 errors on February 26, 2013 by Matthew. Further information on K2 database consolidation can be found here. This entry was posted in K2 and tagged K2, K2 blackpearl, K2 blackpoint, K2 configuration, K2 Databases on February 19, 2013 by Matthew. When creating a new K2 environment, it is often easiest to backup and move the K2 database(s) across to the new environment’s SQL server and reconfiguring the database(s) to contain the new environment information rather than to redeploy all existing processes, SmartObjects and solutions into the new environment (which can often cause quite a headache with differing SmartObject GUIDs etc). The above set of commands should succeed, resulting in the required symmetric keys being recreated for the databases. Once you have run these commands successfully, re-analyse the nodes in the configuration analysis and you should see that they no longer display in error. This entry was posted in K2 and tagged Authentication, Encryption, K2, K2 blackpearl, K2 blackpoint, K2 Databases, Single Sign On, Symmetric Keys on September 7, 2012 by Matthew. Welcome to the new Techmongrel! Well it’s been a while since the original techmongrel was up and running, but I am back and blogging, albeit with a different focus! During the past few years, I have worked as a K2 and SharePoint consultant in and around Johannesburg South Africa and would like to use this blog as a platform to share some of the things I have learned and continue to learn. So if you are interested in either K2, SharePoint, InfoPath or C#, come back regularly and leave some comments! This entry was posted in Notices and tagged Notices on February 6, 2012 by Matthew.